I am going to modify Rescatux 0.32 roadmap so that it’s easier to release Rescatux 0.32 even if it lacks some importants items. We drop UEFI Boot Support. This does not mean not being able to fix grub systems based on UEFI. What it means is that I was going to make sure that you could boot Rescatux cd in EFI mode without a problem. You will be able to boot Rescatux cd from a UEFI system if the CD is booted in legacy boot mode (BIOS) but not as EFI mode. The reason for dropping this UEFI boot support is because of Debian Live for its Debian Wheezy version not being good enough for enabling UEFI boot based on grub2. I also do not want to achieve the same result by using current SG2D and the Rescatux isolinux image as I did in the old days. I just want a plain isolinux based ISO image and that’s it. I also do not want to rebase Rescatux on Debian Jessie even if it’s tempting. 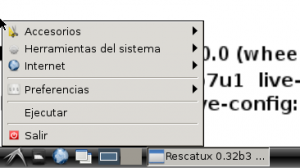 Once we release the stable Rescatux 0.32 we would be able to think about rebasing Rescatux on Debian Jessie which its Live Build package will have EFI support based on syslinux / isolinux. Not yet, but I’m sure that they won’t release Debian Live for Jessie without EFI boot support because it’s a must nowadays. Doubts about SELinux. I was about to drop SELinux support but I will make more tests and depending on the result I might drop it or not. Well, that’s not as much as I had thought but these are some changes. Hopefully I do not rewrite release roadmap for 0.32 in the future again. You can check the complete changelog with link to each one of the issues at: Rescatux 0.32-freeze roadmap. 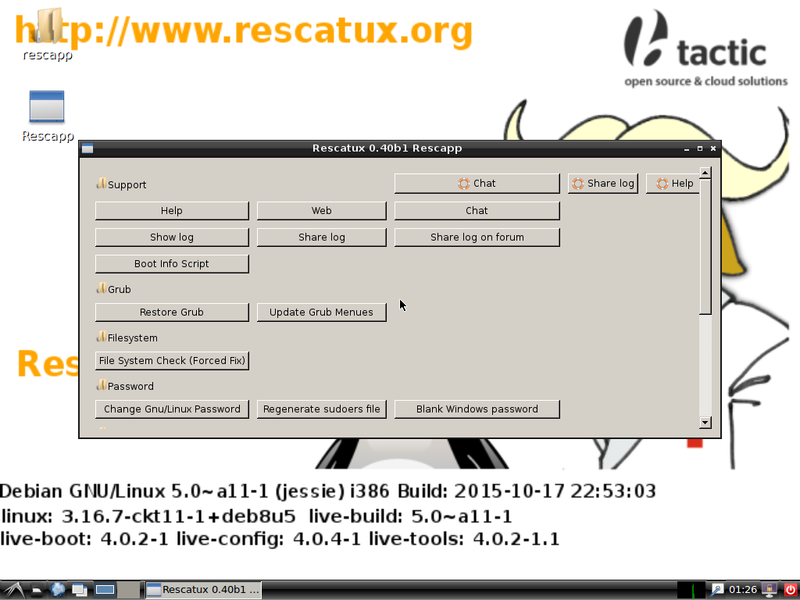 So this is the official Rescatux tutorial based on the latest 0.32 beta 3 Rescatux. Please enjoy the full show or select the section that matches your need. If you are more interested on what Rescatux can do instead of how you are supposed to use it please check Summary . If you want to make use of the Recover Windows boot option ( Restore Windows MBR (Beta) ) make sure to use Rescatux 0.32 beta 2 or a newest version else you might get your Windows 7 unbootable even if you use the latest stable 0.30.2 version. My English is not perfect and I will try to improve it for the next videos. Rescatux 0.32 beta 3 has been released. Rescatux 0.32b3 size is about 469 Megabytes. This new beta release only has a new feature but it’s a long awaited feature. Now you will be able to select your own language, country and keyboard at boot so that, among other things, you can ask help in the integrated chat with your beloved keyboard layout. This would not have been possible without the work from Tails project on tails-greeter. My tails-greeter fork is a quick and dirty modification so that it fits into Rescatux. However what I want to achieve is a default greeter in Debian Live so that one can choose its keyboard layout (and other settings) from Xorg. I’m subscribed to tails-dev mailing list and I will soon ask them about how to modify tails-greeter so that we can share a common codebase between tails-greeter and live-greeter?. I’m not convinced about them being based on gtk, and even worse, based on gdm3 which pulls quite many dependencies which I never thought were needed for a dm. Yes, I’m tempted to rewrite it into QT but maybe it’s not worth the effort. I will probably try to modify tails-greeter so that it’s based on lightdm instead of gdm3. This task seems more feasible for me. Finally on the translation side don’t expect Rescapp to be translated, even in Spanish, because translation subsystem is not implemented and nobody has offered to do so. I think I’m also dropping the Spanish documentation (No one has offered himself to translate it) because this way I won’t have to update it. One less task to do for the release. What I mean is that while choosing your language, country and keyboard will affect the rest of the distribution do not expect Rescapp to be affected by the language and country settings. It will be only affected by the keyboard setting. Packages versions for this release can be found at Rescatux 0.32b3 packages. It’s based mainly on Debian Wheezy (Stable). Some packages are from Debian Jessie (Next stable). 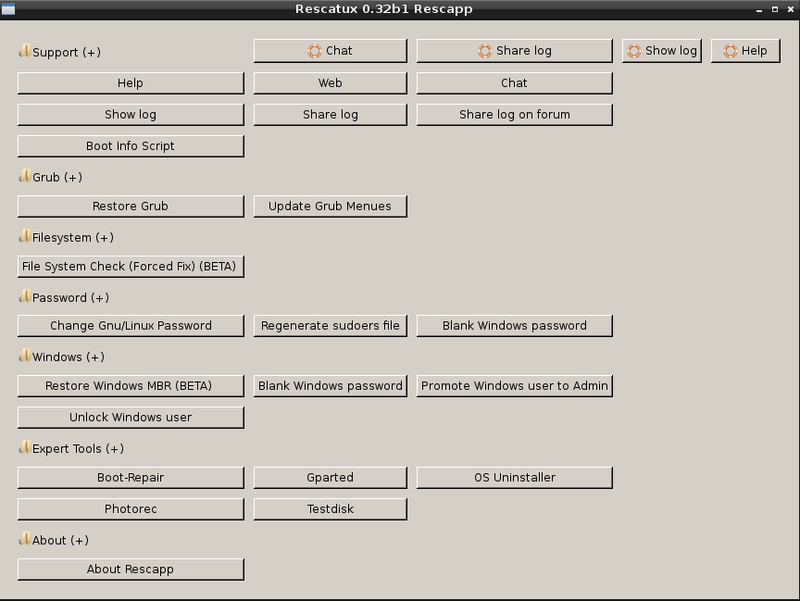 Rescatux 0.32 beta 2 has been released. Rescatux 0.32b2 size is about 444 Megabytes. 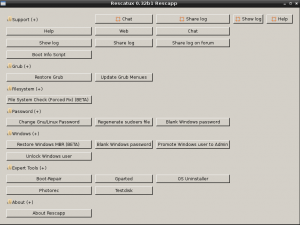 Rescatux 0.32b2 updated options : Restore Windows MBR, Blank Windows password, Promote Windows user to Admin and Unlock Windows user. Update as 25th October 2014. I had mistakenly thought that install-mbr was a program from syslinux package. So, so sorry syslinux guys. Actually it is from the mbr package and the bug about turning a Windows 7 partition unbootable is already reported at: https://bugs.debian.org/cgi-bin/bugreport.cgi?bug=725417 . Now that I know what a disk id is I might write a tool on fixing these kind of problems, specially if you think that current stable Rescatux generates these errors. I have had a hard work trying to make the winunlock command (for unlocking windows passwords from command line) because original winpasswd command was not working ok! I have sent an email to upstream chntpw so that it fixes it. Hopefully there is a new upstream release and we can enjoy it both fixes in Debian soon. Here there is my fork: chntpw-ng . As you might imagine the biggest improvement in this release is that resetting windows password, promoting a windows user to Administrador and unlocking a windows user uses the latest version of chntpw which makes easier and more safe to add users to the admin group. It also fixes a bug that prevented a promoted admin user to be demoted from windows. ( grub rescue > ) problems when you remove GNU/Linux partition from Windows itself. Unfortunately that only works if Windows boot partition is in the first hard disk. This is the Restore Windows MBR option which it’s going to be still BETA till many of you report me that it works ok. The difference is that the old version did break working Windows seven (and probably others) boot when used. So that it’s fixed. There is not Super Grub2 Disk available from boot menu but, as you can see per, the pending bugs there will be one. Finally you can boot Rescatux from Super Grub2 Disk thanks to its loopback.cfg file which I hope will be accepted upstream in Debian Live soon although they seem to be busy with Jessie freeze. In the development arena I have removed old scripts and add new build folders so that everything is easier to understand when developing Rescatux. This release is very needed so that we can all test this new 140201 chntpw version before I release the stable version in probably less than three months. So please report any bug if you find them. So, contrary to other versions I encourage to download it so that we can debug it. I almost forgot that we have a new background for you to enjoy! This is the first time that I recycle older changelog so that you can see the full changes as a whole (well, actually only from Rescatux 0.32b1). There has been other improvements in this release so I encourage you to click on the Rescatux 0.32-freeze roadmap link so that you get more detailed information about them. Packages versions for this release can be found at Rescatux 0.32b2 packages. Translate the documentation of new options to Spanish. This is the Rescatux 0.32 release roadmap. Please comment below if you feel that something is missing or incomplete here. Help is welcomed in fixing these issues. Please join the Rescatux mailing list if you want to help either testing or either fixing one of these bugs. While I was going to categorize many offline notes that I have about Rescatux about bugs I thought again about current bugs versions. I have added a note in the Rescatux wiki about the new bug versions. 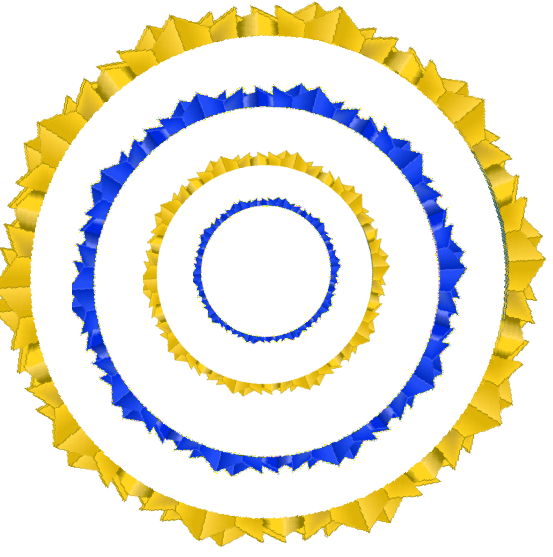 version-freeze: E.g. 0.32-freeze are error only found on beta versions that we have decided need to be addressed in order to release its associated stable version. Unfortunately in order to see what are these affected bugs you need to have an account in Cenatic and then build an advanced query inside the Rescatux Bugs tracker. This is not bad because you can create an account in Cenatic Forge whenever you want to. The purpose in this versioning change is knowing what it’s the minimal set of bugs that need to be solved so that I can release new Rescatux as an stable release. And, at the same time, not having to take care manually of a roadmap. Feature requests are still present and are not affected by this version renaming.